Download the sample file of simplified Orders template. When creating new Orders, leave this value empty. Name Text Name of the Order. Shopify allows several orders to have the same name, however, the app uses the Name as the “key” to identify the existing order. So it works in a similar way as Handle for Products. When you are importing an order with the same Name that already exists in your store, then the app will try to update or replace it (depending on what Command you have). When migrating orders from one Shopify store to another, this Name field is the only way to tell that the order is the same as in the other store. To be safe, be sure to have your Order names unique when importing. If you need Shopify to generate the next Name automatically for you, leave the Name column empty, or delete it entirely from the import file. If you need your Order to consist of several rows, the next Order is determined when Number column value changes. Name cannot be updated, it can be only set when creating a new order or replacing one. When importing Order, it tells the app, what to do with it. NEW: will try to create a new Order with the provided details. If such Order will already exist (with the same ID or same Name), then Order creation will fail. UPDATE: Allows to update some of the existing Order attributes. Here is the list of what can be updated. REPLACE: at first, if such Order with provided ID or Name exists, then the app will delete it. After that, it will create a new one. If an existing Order will not be found, then still the app will create a new Order. DELETE: the app will delete the existing Order, which is found by ID or Name. If such order will not be found, then this order import will fail. This DELETE command can be very handy, when Orders need to be deleted in bulk, or when such orders need to be deleted, which cannot be deleted through the Shopify Admin. Tells whether to send a notification receipt Email to the customer when Order is created or updated. See column “Fulfillment: Send Receipt” for sending fulfillment receipts. The behavior to use when updating inventory. (default: bypass). bypass: Do not claim inventory. decrement_ignoring_policy: Ignore the product’s inventory policy and claim all amounts no matter what. decrement_obeying_policy: Obey the product’s inventory policy. Number Number Order internal number. If the ID and Name are empty when creating new Order, his Number determines which rows belong to which Order, and where the next Order rows begin. Exported only. When importing, Shopify will automatically increment it. Can be a large text going over several lines. Here I can write any notes I need for the Order. Tags Comma Separated List Tags allow you to add additional elements or “properties” to your order, which you can use for filtering. Created At Date & Time This column will only be exported. It will be automatically set to the time when the Order was actually created. When migrating from another store, this time will always be the time of migration. Updated At Date & Time This column will only be exported. It will be automatically updated, whenever you change the Order data. Cancelled At Date & Time This column will show the time when the order was canceled. It will be empty if the order is not canceled. Cancel: Reason Text Shows the reason, why the order was canceled. customer: The customer changed or canceled the order. fraud: The order was fraudulent. inventory: Items in the order were not in inventory. declined: The order was canceled because the payment has been declined. other: The order was canceled for a reason not in the list above. Whether to send the e-mail to customer telling that the Order was cancelled. If the Order is already cancelled then it will fail – because it cannot send the e-mail to alreaday cancelled Order. When you are cancelling the Order, if you set this to TRUE then this Order will be also fully refunded. Processed At Date & Time This column will show the time when the original order was created. When migrating from the other system, you can set this field to a date, when the order was created in the source system, and Shopify will show that date as order creation date. Closed At Date & Time This column will show the time when the order was archived. Currency Currency code in ISO 4217 format Currency of the Order. Source Text When exported, will have the original channel, where the order came from, like: web, pos, iphone, android, shopify_draft_order. When importing as new or replaced order, you can set any value (except the following Shopify reserved words: web, pos, iphone, android, shopify_draft_order). Cannot be updated, can be only set when creating a new order or replacing one. If you leave this value blank when creating the order, it will be set to “Excelify.io App”. User ID Number Shopify internal user ID, who created the order. When importing, Shopify will set it to the ID of the user who initiated the import. Cart Token Hash For orders that were initiated through the shopping cart, this will be the reference to the cart from which the order was created. When importing, this value cannot be set. Token Hash Token key, how the order is identified in the Shopify system. It’s unique to all stores. You cannot set its value, it is always set by Shopify. Token is used in the Order status URL. Order Status URL URL The URL, where a customer can view their order status. Weight Total grams Total weight of the ordered items, in grams. Price: Total Line Items Currency Total price of all line items. This is calculated from actual line items, and cannot be set as a value in the import. Price: Subtotal Currency Value of the order, including discounts, but before shipping and taxes. Text Title of each applied tax. Each order can have up to 3 different taxes applied, therefore all those are split into separate tax columns. Only exported. To import Taxes – fill those for the Line Items. Tax 3: Rate Number The rate of the tax applied. Currency The calculated tax in the order currency. Tells whether the order subtotal has taxes included or not. Tax: Total Currency Total amount of the tax applied to the order. Price: Total Currency Total amount of the order, including line items, discounts, shipping cost, and taxes. pending: The finances are pending. Payment might fail in this state. Check again to confirm whether or not the finances have been paid successfully. authorized: The finances have been authorized. partially_paid: The finances have been partially paid. paid: The finances have been paid. partially_refunded: The finances have been partially refunded. refunded: The finances have been refunded. voided: The finances have been voided. When importing, you can set this value, but this will just mark the status on Admin, however, it will not generate the respective Transactions or Refund Transaction, so the “Paid by customer” will show 0. To have the amount visible in the “Paid by customer” you need to add the respective “Transaction” or “Refund” lines. By default, it is set to “paid”. checkout – payment was done by the client at the Checkout. direct – paid directly from the Order in the Shopify Admin, but using the actual customer payment method, for example, charged the credit card or paid by PayPal. manual – marked as paid manually from the Order in the Shopify Admin, without collecting any actual payment through the Shopify. 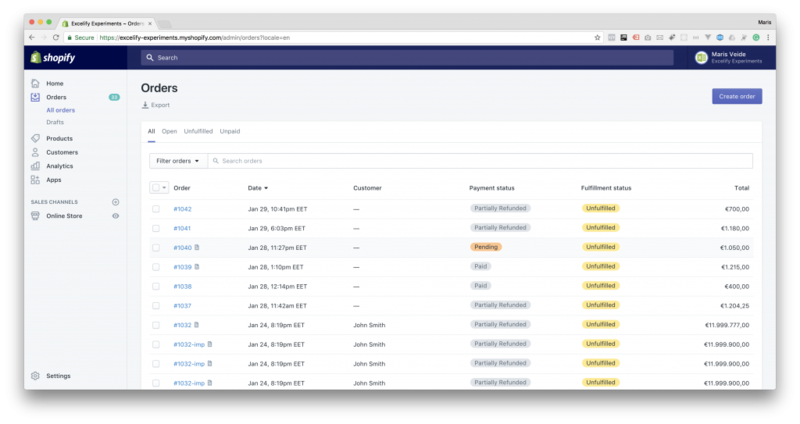 offsite – paid by Shopify POS. express – paid by PayPal Express. The method is deduced by the actual transactions on the order. Summarized status of the order fulfillment – only exported. <empty>: There are no fulfillments done on the order yet. partial: Order is fulfilled partially, meaning that at least one item has been shipped. fulfilled: All line items are fulfilled or returned. There is nothing more to fulfill. To import Order with a certain Fulfillment Status, you need to create Fulfillment Lines and fill in Fulfillment columns. See documentation further. Additional Details Lines of “name: value” Additional details collected on the order from the customer – either from the product page or from the checkout page. Each added property will be shown as “<name>: <value>”, and will include all of those properties as several lines inside the Excel cell. When prepared in the same format, those details also can be imported. Those are visible in Shopify Admin, on each Order, section “Additional Details”. This section shows only if there are any details added, otherwise it’s not visible there. Each Order can have one customer or no customer at all. When importing Orders with Customer data, Shopify will link them by Email to existing customers, or create new Customers if they don’t exist yet. If you need to change the fields of existing Customer, you cannot change them through Draft Order – you need to import the update through the Customers sheet. Customer: ID Number Shopify generated Customer ID. If specified existing customer ID from that store, Order will be linked to that customer. If you don’t have an ID, then leave it empty, and Shopify will link to existing customer by Customer Email. Customer: Email E-mail Customer e-mail who purchased the Order. The app will link to existing store Customer by this e-mail or Phone number if e-mail is empty. If the app will not be able to find existing customer to link to, it will create a new customer. Shopify is very strong about validating e-mail addresses – it is checking if e-mail actually exists in real life. If you import e-mails and get the error that Email is not valid then first you should check that this e-mail is really correct. If it happens to be some old customer Email which you still need to import then you can move that Email value to Note field and leave this Email field empty. When updating – will update only contact information on the Order, but will not change the data of the Customer. Customer: Phone Phone Number Phone number must be full – with the country code and must be valid for the respective country. You can prefix phone numbers with ‘ (apostrophe) to allow Excel to show the + (plus) sign. But the + (plus sign) is not required. The app will clean out any non-digit characters from the Phone field. If e-mail is empty, the app will search existing customer by Phone number – and if will find, then will attach this order to that customer. To change for an existing Order – change the data of the Customer. Customer: First Name Text The first name of the Customer. Customer: Last Name Text The last name of the Customer. Customer: Note Text Whatever is written on the Customer card, accessible from Shopify Admin. Customer: Orders Count Number Total count of orders made by this Customer. disabled: customers are disabled by default until they are invited. invited: the customer has been emailed an invite to create an account. enabled: the customer accepted the email invite and created an account. declined: the customer declined the email invite to create an account. If Customer has declined your invitation, you cannot generate new Account Activation URL. Customer: Total Spent Amount Total amount the customer has spent at the moment of the export. Customer: Tags Comma Separated List Tags allow you to add additional elements or “properties” to your Customer, which you can use for filtering, for developing some additional logic for those Customers in your Store Theme. Whether Customer accepted that he can be sent Marketing e-mails. All the following fields will be shown in the Order in the Billing Address block. When imported, will be added as one of the addresses for the Customer, too. Billing: First Name Text The first name of the Customer in the Billing Address. Billing: Last Name Text The last name of the Customer. Required. If empty, the address will not be created. Billing: Company Text Company name, if the billing address is a company. Billing: Phone Phone Number Phone number to use for this address. Billing: Address 1 Text Address 1st line. Billing: Address 2 Text Address 2nd line. Billing: Zip Zip Zip number of the address. Shopify doesn’t check its correctness. Billing: City Text City name. Is not checked, so it’s possible to enter any city name. Billing: Province Province Name Province names are checked against Shopify geographic classifier. If provided province will not be valid, then Shopify will accept it, but it will be empty on the customer card. If you are not sure, what are available values, go to Shopify Admin, edit the Address, and click the drop-down to choose the Province for chosen Country. If Province Code is filled, this can be left empty, then Province will be set from there. Billing: Province Code Province Code In Shopify classifier there are Province Codes. If provided province code will not be valid, then Shopify will accept it, but it will be empty on the customer card. If Province is filled, this can be left empty, then Province will be set from there. Billing: Country Country Name Country names are checked against Shopify geographic classifier. If the provided country will not be valid, then Shopify will accept it, but it will be empty on the customer card. If you are not sure, what are available values, go to Shopify Admin, edit the Address, and click the drop-down to choose the Country. If Country Code is filled, this can be left empty, then Country will be set from there. Required Country or Country Code. If empty, the address will not be created. Billing: Country Code Country Code Country international code, consisting of 2 letters. If Country is filled, this can be left empty, then Country will be set from there. All the following fields will be shown in the Order in the Shipping Address block. When imported, will be added as one of the addresses for the Customer, too. Those columns are the same, as for Billing Address, just the column name starts with “Shipping: …”, so those will not be repeated here. All the following columns can just be exported, but they provide valuable information about the customer, the source the customer came from, even the marketing campaign. Browser: IP IP Address The IP address of the customer at the moment of purchase. Browser: Width Number Width of the customer browser window, in pixels. Browser: Height Number Height of the customer browser window, in pixels. Browser: User Agent Text Full user agent string of the customer browser. From this string, it is possible to reconstruct further details like the used browser and the operating system. Browser: Landing Page URL The first page the client landed on your site, before making the purchase. This allows you to analyze, which pages are the ones that drive most purchases eventually, and also allows you to draw conclusions about the effectiveness of your marketing efforts. Browser: Referrer URL The site, where your customer came from when eventually made a purchase order. This allows you to understand, what are your most valuable traffic sources. Browser: Referrer Domain Domain Since the Referrer URLs will be listed with all the URL parameters, it might be hard to conclude, which of the traffic sources give the most valuable traffic. That’s why this field contains just the domain of the referrer so that you can group them together when doing your analysis. Browser: Search Keywords Text Keywords used in the search engines, when your store was found, which led to the order. This is an even deeper insight into how your customers find your store, and which keywords sell. Browser: Ad URL URL The destination URL that was included in your Ad. This allows you to know and measure, which URLs from your ad campaigns are most effective to produce orders. Browser: UTM Source Text Source, extracted from UTM parameter “utm_source”. For AdWords campaigns, those parameters are set automatically, but you can also send traffic to your store by filling them according to your needs. Browser: UTM Medium Text Medium, extracted from UTM parameter “utm_medium”. Browser: UTM Campaign Text Campaign, extracted from UTM parameter “utm_campaign”. Browser: UTM Term Text Term, extracted from UTM parameter “utm_term” – identifies the paid search keywords entered by the customer, when showing your ad campaign. Browser: UTM Content Text Content, extracted from UTM parameter “utm_content” – identifies the ad variation, or the specific element or version you are testing for your campaign. Each Order must have at least one line item. An order consists of “Line Items”, where each of them as a certain line type. That allows to group items together in a fashion that can be reconciled with actual order data, and most importantly – cross-check that all amounts match. Some of the line types will have details in the Line Item columns, but some will have details in their own respective columns. Line Item: Order line item. Discount: Discount which is applied to the whole order. An Order can have only one discount line. Shipping Line: Shipping cost of the whole order. An Order can have only one shipping line. Transaction: Indicating that in this line the transaction columns are filled. Each transaction line represents one actual transaction for the Order. See more details in the Transaction Columns section. If the transaction is a refund transaction, then it can reference several refund lines – through common refund columns. Refund Line: Line items that belong to a certain refund. Must have the same attributes filled for line items, and show the quantity and totals in reverse – depending on how much is being refunded. Also, the Refund Columns need to be filled for each refund line. One Order can have many refunds, with many refund lines per refund. Refund Shipping: If you need to refund the Shipping Line, then those details need to be entered in this line. One refund can combine refund lines and refund shipping lines. Shipping can be refunded several times until the refunded amount fully exhausts the initial shipping line amount. Fulfillment Line: Indicates that in this line the Fulfillment details are written. Each Order can have several Fulfillments. And each Fulfillment can have several Fulfillment Lines – one line per Line Item being fulfilled. An Order can have additional fulfillments until all line items fulfillable quantities are fulfilled completely. If you want the whole order to be fulfilled, leave the rest of “Line:” values empty. Line: ID Number The line identifier. When exporting, the Shopify generated IDs will be used. Also, when importing, the IDs will be re-mapped to new IDs, which Shopify will generate. Line Item: each will have its own Line ID, generated by Shopify. When creating a new Order, Line:ID must be filled with any unique number. Shipping Line: has an ID, generated by Shopify. When creating a new Order, can leave empty. Transaction: has no Line ID, because Transaction ID is stored in the “Transaction: ID” column. Refund Line: has the same ID as the Line Item that is being refunded. That allows to precisely match line items and refund lines in reports. When creating a new Order, can leave empty. Refund Shipping: has a specific ID taken from the shipping refund entry. When creating a new Order, can leave empty. Fulfillment Line: has the same ID as the Line Item that is being fulfilled. That allows to precisely match line items and fulfillment lines in reports. When creating a new Order, can leave empty. Line: Product ID Number Product ID of the line item, generated by Shopify – if the line item is a product. Line items can be custom, without a link to the Product, in that case, the Product ID will be empty. When importing an Order, can have a real product ID from the store. If such ID will not be found in the store (e.g. when copying Orders from another store), then the app will try to match it by “Line: Product Handle” column value. Line: Product Handle Text This is the secondary way, how to identify the product if it can’t be found by Product ID. It is used in cases when copying orders from one store to another, which have the same Products – then the right product will be linked to the order by the Handle. Line Item: the title of the Order line item. When importing, even if the actual linked product will have a different title, the Order line item title will be set to this one. Discount: “percentage” or “fixed_amount”. Used only in the export. Import always assumes the fixed_amount type of discount. Shipping Line: the shipping title written in free form. Refund Line: must match the “Line: Title” of the line item that is being refunded, because it is used as part the key identifying the refunded line item. Fulfillment Line: must match the “Line: Title” of the item that is being fulfilled, because it is used as part the key identifying the fulfilled line item. Line Item: full name of the Order line item, which includes the variant title. Formatted: <product title> – <variant title>. When importing – it will be saved, but will not be visible anywhere on the Order screen. Discount: the free text comment that was written for the discount. If the discount code was used, then it will be here. Shipping Line: the shipping code, usually has value “custom”. Refund Line: in export will match the line item name. In import can be anything – it will be saved, but will not be visible anywhere on the Order screen. Fulfillment Line: in export will match the line item name. In import can be anything – it will be saved, but will not be visible anywhere on the Order screen. Line: Variant ID Number Variant ID of the line item, generated by Shopify – if the line item is a product. In case of the custom line item, this ID will be empty. When importing an Order, can have a real variant ID from the store. If such ID will not be found in the store for that product (e.g. when copying Orders from another store), then the app will try to match it by “Line: SKU” column value. Line Item: the title of the product variant included in the line item. Shipping Line: the shipping source, usually “shopify”. Refund Line: must match the “Line: Variant Title” of the line item that is being refunded, because it is used as part the key identifying the refunded line item. Fulfillment Line: must match the “Line: Variant Title” of the item that is being fulfilled, because it is used as part the key identifying the fulfilled line item. Line Item: the SKU of the product variant included in the line item. Refund Line: must match the “Line: SKU” of the line item that is being refunded, because it is used as part the key identifying the refunded line item. Fulfillment Line: must match the “Line: SKU” of the item that is being fulfilled, because it is used as part the key identifying the fulfilled line item. Line Item: the quantity of the line item purchased. Refund Line: the quantity restocked back if a refund is done with restocking. The number is negative. Fulfillment Line: the quantity being fulfilled in that particular line of fulfillment. The number is negative. Having positive and negative quantities in their respective lines allows summing this quantity column and will always give a quantity that still needs to be either fulfilled or refunded. Good for reporting. Line Item: the price of one line item purchased. Shipping Line: the price of the shipping applied to the order. Refund Line: must match the “Line: Price” of the line item that is being refunded, because it is used as part the key identifying the refunded line item. Refund Shipping: the amount of shipping being refunded. Positive number. Fulfillment Line: must match the “Line: Price” of the item that is being fulfilled, because it is used as part the key identifying the fulfilled line item. Line Item: line item discount. Can be entered only through Shopify Admin, and will be filled for the export. When importing, this value will be automatically added to the order discount, because Shopify doesn’t allow setting line item discounts through API. The amount is negative. Discount: the whole order discount amount. The amount is negative. Amounts in this column are organized so that you can sum all discount column per order, and get the correct total discount value for that Order. Line Item: line item total as Quantity * Price + Discount (because Discount is negative). Refund Line: refunded line item total as “refunded quantity” * Price (result will be negative because refunded quantity is negative). Refund Shipping: the total amount of shipping being refunded. Negative number. Amounts in this column are organized so that you can sum all Line Totals per order, and get the correct total value for that Order. If the order is fully refunded, then the sum of all total lines for that Order must be 0. Line Item: weight per line item sold (weight of one item). Refund Line: must match the “Line: Grams” of the item that is being refunded, because it is used as part the key identifying the fulfilled line item. Fulfillment Line: must match the “Line: Grams” of the item that is being fulfilled, because it is used as part the key identifying the fulfilled line item. Line Item: TRUE if the line item requires shipping. Refund Line: TRUE if the line item requires shipping. Fulfillment Line: TRUE if the line item requires shipping. Line: Vendor Text Vendor name of the product purchased. Line: Properties Lines of “name: value” Additional details collected on the order from the customer about the line item – either from the product page or from the checkout page. Those are visible in Shopify Admin, on Order, for each Line Item. Those properties show only if there are any added, otherwise, they are not shown here. TRUE if the line item is a gift card. If set to TRUE Shopify will send Gift Card email to the customer. TRUE if the line item is taxable. Line: Tax 3 Title Text Title of each applied tax. Line: Tax 3 Rate Decimal Number The rate of the tax applied. Line: Tax 3 Price Currency The calculated tax in the order currency. Line: Fulfillable Quantity Number The quantity of the line item that is still left to be fulfilled. Only exported. For import this is calculated from actual fulfillments. Service provider handle who is doing the fulfillment. To find out the handle, easiest is to enter one through the Shopify Admin, and then look in the export file. If empty, will be assumed as “manual” by default. Exported only because it is actually calculated from the Order data. Those columns are only exported. They will get ignored if being imported back. Note that if you change the data of your Shopify Product, the Order Line items will remain as they were when the order was placed, but the Product Data columns will contain the current product data. If you have the inventory distributed across several locations, then this quantity will show the total sum of available inventory of this variant across all your locations. Shipping origin columns extend the rows of line type “Line Item” with additional information – the location and the warehouse from where the line items are being shipped. It can only be exported, as it is tied to the shipping provider actually used. To be used for reporting and tracking of shipments. Shipping Origin: Name Text The shipping origin name. If no shipping provider us used, then this will be the Shopify store contact address. Refund columns extend the rows of line type “Refund Line”, and contain additional data about refunds. Refund: ID Number The ID of the refund, generated by Shopify. Only exported. When importing, need to be the same number for all the refund lines that belong to the same Refund. This number will be used to link those refund lines together and include them in that refund transaction. Refund: Created At Date & Time Date and time when the refund was created and processed. Refund: Note Text Note attached to the refund, usually explaining the refund reason. TRUE if the line items are being restocked. Meaning that quantities are increased back in stock. Refund: Restock Location Location Name If you have the “Refund: REstock” set as TRUE, then you can set here the name of the location to which the restocked items should be sent. If you leave this empty then the items will be sent back to the first location. Read more about Multi-Location Inventory. When you create a Refund, set this to TRUE if you want the customer to receive a notification receipt of that refund. Transaction columns extend the rows of line type “Transaction”, and contain data about transactions. Transaction: ID Number The ID of the transaction, generated by Shopify. Only exported. When the transaction for a refund is created, it needs to have also the column “Refund: ID” filled with the same refund ID that was assigned to all refund line items. That way the transaction is linked to the refund. authorization: represents an amount reserved against the cardholder’s funding source. Money does not change hands until an authorization is captured by “capture” transaction. There can be only one authorization transaction per Order. capture: transfer of the money that was reserved during the authorization stage. There can be several capture transactions per order, until they reach the total sum of authorization transaction. sale: an authorization and capture performed together in a single step, usually by pressing the “Paid” button in the Shopify Admin. In this case there will be no associated card transaction. There can be only one sale transaction per Order. You can import sale transaction for existing order with remaining amount to mark the order as paid. refund: a partial or full return of captured funds. A refund can only happen after a capture or sale transaction, and cannot exceed their amount. There can be several refund transactions – one per Refund. void: cancellation of a transaction. Transaction: Processed At Date & Time Date and time when the transaction was created. Can be also imported – and reports should show the Transactions on the correct dates. Transaction: Amount Currency The transaction amount. For the capture transactions, the amount can be less than authorization amount, so there can be several capture transactions. For refund transactions the transaction amount can be different from the line items total amount being refunded, because sometimes there can be non-full refunds, or refunds that are bigger than the cost of line items. Transaction: Currency Corrency code in ISO 4217 format The currency of the transaction. Since the Shopify store can operate in just one currency, it’s best to have the transaction currency the same as the Order currency, and as the Store default currency. Shopify doesn’t do any currency conversions. The transaction status is mainly for the export. When importing, there is no point importing transactions with statuses other than success. Transaction: Message Text Transaction comment generated by the Shopify. Usually the name of the reply of the used payment gateway. Only exported. Transaction: Gateway Text The name of the used payment gateway. When importing void or refund transaction, must match the same gateway as the original transaction. TRUE if this is a test transaction. Transaction: Authorization Number Authorization code provided by the payment gateway. Only exported. The error code, indicating the reason for failed transaction. The same codes for any payment gateway. Only exported. Transaction: CC AVS Result One character The Response code from AVS the address verification system. The code is a single letter; see this chart for the codes and their definitions. Only exported. Transaction: CC Bin Number The issuer identification number (IIN), formerly known as bank identification number (BIN) of the customer’s credit card. This is made up of the first few digits of the credit card number. Only exported. Transaction: CC CVV Result One character The Response code from the credit card company indicating whether the customer entered the card security code, a.k.a. card verification value, correctly. The code is a single letter or empty string; see this chart for the codes and their definitions. Transaction: CC Number Masked Card Number The customer’s credit card number, with most of the leading digits masked with •. Only exported. Transaction: CC Company Text The name of the company who issued the customer’s credit card. Only exported. Each Order has an associated fraud risk evaluation from Shopify or other risk assessment service, which is exported to risk those columns. Risk: Source Text The source of the risk assessment. Risk: Score Decimal number A number between 0 and 1 that is assigned to the order. The closer the score is to 1, the more likely it is that the order is fraudulent. cancel: This order should be cancelled by the merchant. investigate: This order might be fraudulent and needs further investigation. accept: This check found no indication of fraud. This will indicate that this risk was severe enough to force cancellation of the order. Risk: Message Text A message explaining the risk. This order came from an anonymous proxy. Each Order can have none, one or many fulfillments, which are essentially – the deliveries of ordered line items. Each fulfillment can contain one or many line items of different quantities. Fulfillment: ID Number Fulfillment ID generated by Shopify. Is used to group together line items into fulfillments. Those columns need to be filled for the Line: Type “Fulfillment Line”. Rows with the same Fulfillment ID will be grouped into the same fulfillment. When importing, you can invent your own Fulfillment ID, which will allow you to group line items into fulfillments. pending: The fulfillment is pending. open: The fulfillment has been acknowledged by the service and is in processing. success: The fulfillment was successful. cancelled: The fulfillment was cancelled. error: There was an error with the fulfillment request. failure: The fulfillment request failed. Fulfillment: Created At Date & Time Date and time when the fulfillment was created. Only exported. When importing, the fulfillment will be dated at the moment when it is being imported. Fulfillment: Location Location Name The name of your Location where the fulfillment is being shipped from. If you leave it empty then the app will assume the first location from your Locations. The status of the shipment. Fulfillment: Tracking Number Text Tracking number provided by the shipping company. Fulfillment: Tracking URL URL The URL to track the shipment. If provided, then it will be imported as given. If empty, then Shopify will generate it from the tracking company and tracking number combination. Tells whether to send a notification Email to the Customer when the Fulfillment is created or updated. Read more detailed documentation on Metafields page. Shopify limits the ability to update existing Orders – as you also can see in the Shopify Admin that you can update only very limited data for an existing Order. Processed At You can change the date when Order was created. Will work only for orders created through the Apps. Cancelled At In some cases, Shopify might not allow canceling an order, for example, if it is already being fulfilled. Although you specify the date here, the Order will be made cancelled as of the moment of the import, because Shopify doesn’t set specific cancel time. Cancel: Reason Can only cancel an Order with one of the following reasons: customer, inventory, fraud, declined, other. If the cancel reason is not specified, the “other” reason will be assumed by default. Cancel: Send Receipt Set to TRUE if at the moment of cancelling the Order, you need the client to receive the e-mail notification about the cancelled payment. Closed At Makes the Order to become Archived. To unarchive, import this column as empty. Although you specify the date here, the Order will be made archived as of the moment of the import, because Shopify doesn’t set specific archive time. Customer: ID Can only set to empty ID – that will remove the Customer from the Order. Cannot switch the Order to another Customer. Customer: Email This will change the Contact Information of that Order. Customer: Phone This will change the Contact Information of that Order. “Fulfillment Line”, together with the “Fulfillment: …” columns. See the fulfillment tutorial. “Refund Line” and “Refund Shipping” together with “Refund: …” columns. See the refund tutorial. “Transaction” – can add Transactions. See the transactions tutorial. Metafield: … Any Metafields can be updated. For specific typical Orders updating scenarios, look into Tutorials / Orders. If you need to update something beyond that is allowed to update, please use the REPLACE command and replace the whole order with another – that will allow you to set any data at the moment of order creation. To import several line items to Order, just repeat the row with the same ID or Name. When importing Orders from scratch, start by the minimal fields, and grow it up from there, using the REPLACE command. Minimal fields are: Line Item Title, Price and Quantity.